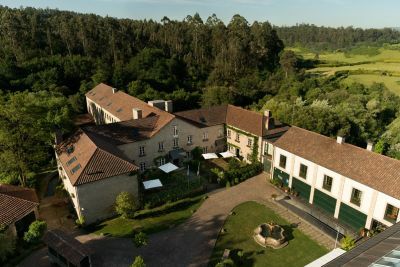 A Quinta da Auga is a boutique hotel, with a luxury Spa and gastronomic restaurant to discover the luxury and the beauty of Santiago de Compostela, Galicia. The only Hotel Spa Relais & Châteaux of Galicia, it is one of the hotels with most charm in Santiago de Compostela. This boutique hotel is located by the River Sar, surrounded by nature. The origin of this stunning building was in the 18th century, built as paper mill of Laraño by Don Nicolas de Santamarina in 1792. According to several written testimonies of the time our history began in Santiago de Compostela as plain paper mill, hence its location on the Sar River to channelise water and use its driving force. In the pre-industrial era was the largest factory of Galicia. The hotel has a unique 5 stars Spa and the high quality of The Filigrana Restaurant a gastronomic experience offering "Galicia Haute Cuisine". The rooms and suites are all different, luxuriously decorated and very romantic. A unique place to relax and enjoy Spa treatments just a short distance from the historic old town of Santiago. A Quinta da Auga Hotel Spa Relais&Châteaux present charming rooms and suites with decorations and elegant ambiences in Santiago de Compostela Galicia. Each room and suite is different and unique, and goes beyond the concept of accommodation, as befits the luxury and exclusivity of a Relais&Châteaux . Charming rooms and suites that combines traditional galician stonewalls, wallpaper, antique and contemporary furniture with an atmosphere of peace and tranquility to enjoy a restful sleep. The linens on the beds with Nordic European down and combed Egyptian cotton covers in pure white, provide a definite note of welfare and ensure a restful sleep. Spa access is possible from any room or suite inside the building through the bedroom area. All our guest rooms feature bathrobes and slippers in addition to other services that you can consult in detail below.. The Filigrana Relais&Châteaux Restaurant is the gastronomic restaurant of A Quinta da Auga, one of the best restaurants to eat at in Santiago de Compostela and enjoy the cuisine and wines of Galicia. As in all Relais&Châteaux, the passion for food it is one of the signatures that distinguish A Quinta da Auga and it is one of its great attractions. Our region, Galicia, offers a great seafood variety of the Atlantic Estuaries and delicious meats from our lush mountains. Galician fish, seafood and meats are renowned worldwide for their excellent quality and unique flavor. These excellent pieces are accompanied by a long tradition of orchard vegetables and legumes, common denominator in all Spanish cuisine. Our Chef Federico Lopez, believes in traditional gastronomy with the treatment of Galician Haute Cuisine. He also carries a daily selection to bring to your table the best of each season. The elegant rooms and the back terrace of the Restaurant Filigrana , overlooking a lush garden and the River Sar environment, make it a very special place to enjoy lunch or dinner accompanied by the sound of water. A green hotel that has received numerous awards because its smarts, ecological and biofriendly facilities in Santiago de Compostela - Galicia. The biofriendly and ecological hotel is an example of sensitivity in heritage restoration, respecting the traditional structure of 18th building and recovering the water pipes of the former paper mill. A Quinta da Auga and combined with solar panels for heating circuit and air conditioning. The heat is spread on the ground around the building fed by a system of vertical geothermal wells 150 meters deep and heat pumps. The preservation of the environment is a commitment in all activities of the design eco hotel A Quinta da Auga Hotel Spa Relais&Châteaux. A Quinta da Auga. Luxury and nature as a lifestyle. A renowned 5-star spa and luxury Spa in Santiago de Compostela and Galicia. Its design and the quality of their hydrotherapy treatments and manual therapies make it a real treat for the senses. Our therapists are experts in men and pregnant women treatments (pre-and post-partum) of any age. In all the spa therapies high end biological cosmetics products are used. The Gft Voucher Spa is a perfect gift for any occasion. Make a unique and unforgettable present. See our rates. We are dedicated to create a relaxing, meditative and calm atmosphere, for all our guests and customers. Please see our rules and information of interest. Come and we will take care of you at A Quinta da Auga Spa in Santiago de Compostela, A Coruña-Galicia.